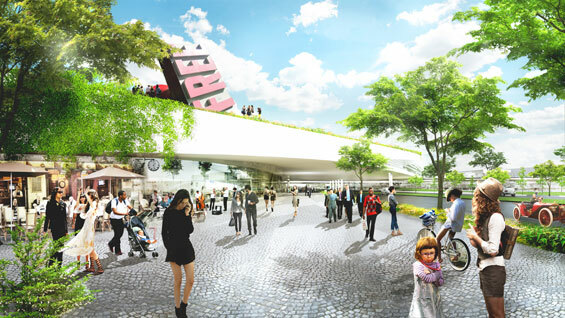 EuropaCity will offer on an unprecedented scale a mix of retail, culture and leisure around a defining theme: Europe, its diversity, its urban experiences and its cultures. 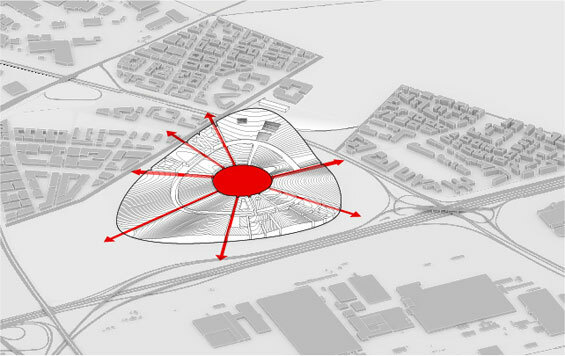 The site has exceptional urban potentials: Locally as a main node on the Grand Paris Express Metro connecting key economic hubs around Paris, regionally as an entrance gate to the metropolitan area of Ile de France and internationally with its direct connection to the second largest airport in Europe. 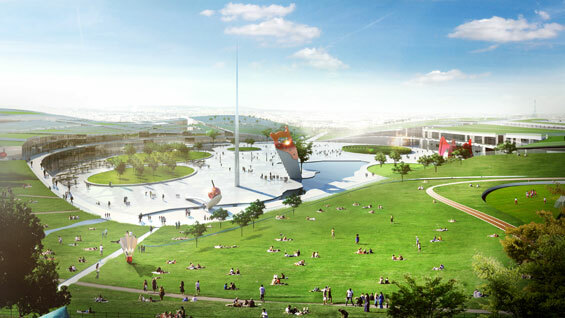 Additionally the site is occupied by a historic agricultural landscape marking the edge between city and open land and offers a panoramic view to the skyline of Paris. 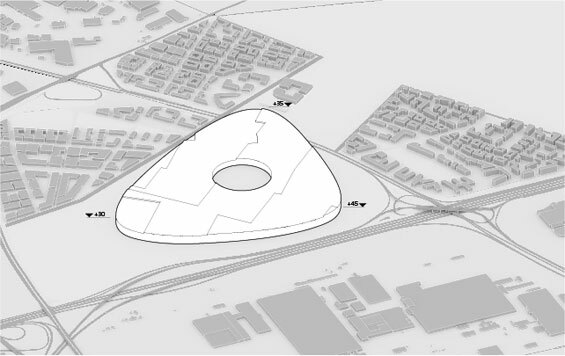 We propose to integrate the new facility in the surrounding business district as an urban form that combines dense city with open landscape, exploring the urban and green potentials of the site at once. 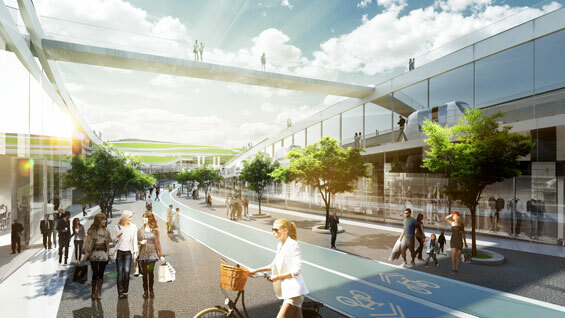 EuropaCity will become a cultural and commercial center – a gathering point for the surrounding cities, injecting true urban qualities into the suburban environment. 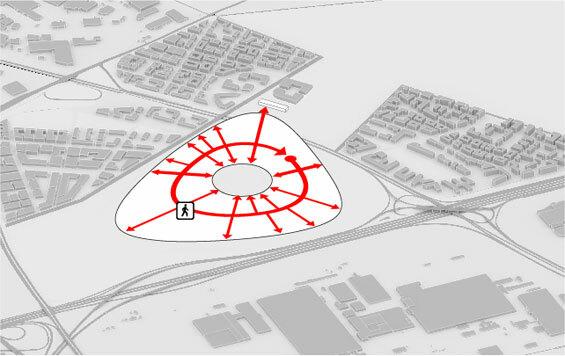 The programs of EuropaCity are organized along an internal circular avenue with a mix of retail, entertainment and cultural programs on both sides. Along the avenue bicycles and electric public transport bring visitors quickly around, the circular avenue creates a variety of spatial experiences and a clear overview – It allows you to get lost, and still find your way. 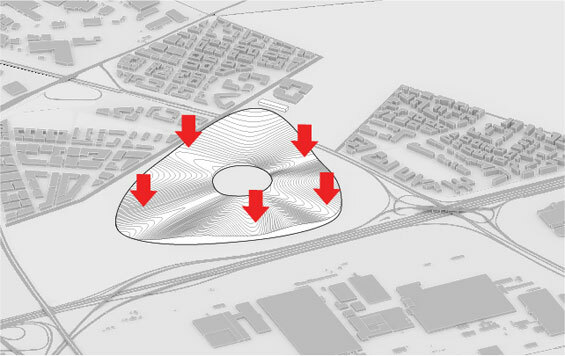 The roof of EuropaCity is conceived as an accessible topographic landscape, allowing visitors to experience the panoramic views to the skyline of central Paris and La Defense. 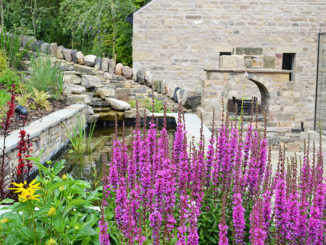 The height is varied along the perimeter, forming a gently sloping landscape of valleys and peaks. In the center a large public park forms a north-south green connection between the historic landscapes of Carré Vert and the Buttes St-Simon. 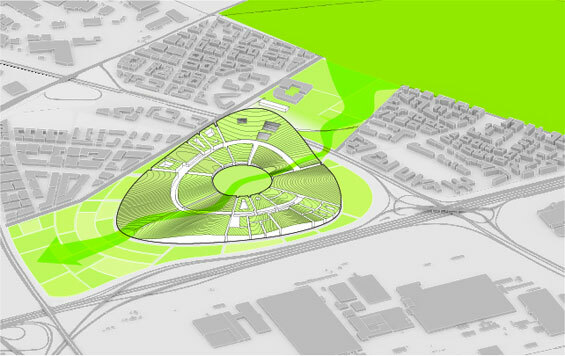 Visible from both highway and urban neighborhoods, it becomes symbolic of Europa City as green development, and offers unique possibilities for integration of recreation and entertainment facilities. 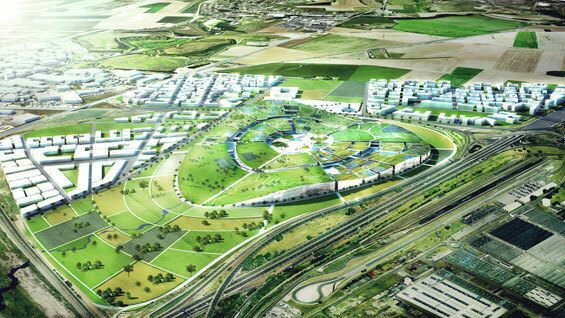 EuropaCity is designed as a laboratory for sustainable technologies, and a showcase for viable green tech implementations that does not only save energy, but also improves the quality of the urban environment. 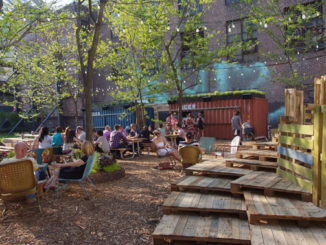 The large range of culture and leisure programs like concert halls, spas, skiing hill, swimming pools and urban farming form an urban ecosystem where resources are fed from one into another. 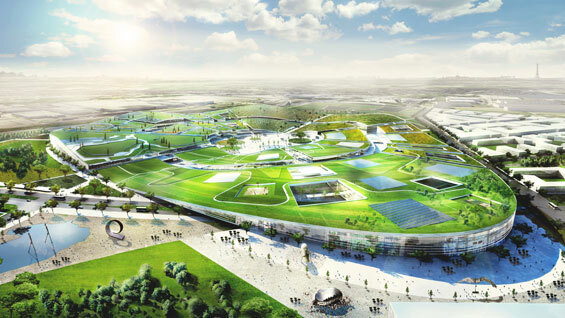 Waste heat from retail is channeled into leisure spas, water is re-used as irrigation for the parks, and EuropaCity will be providing the surrounding neighborhoods with district heating and cooling. 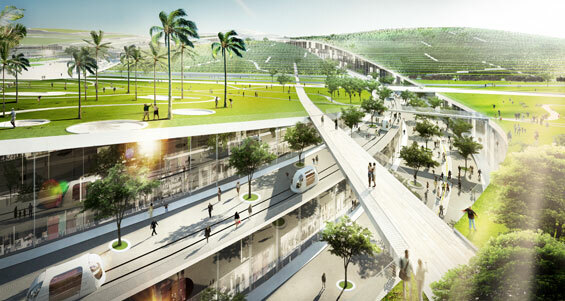 The entire facility is designed to be powered with a combination of solar, biofuel and geothermal energy.